Have you sat through a cremation arrangement meeting with a funeral home? If so, you probably reached the end of the financial paperwork and asked, “What are all the cremation fees?” Let’s talk about some of the most common ones. When the Medical Examiner becomes directly involved, there can be an additional charge, again determined by the county, to cover a portion of this expense. In some cases, there may also be a charge if additional equipment is required. In Texas, all of these cremation fees are determined by county. 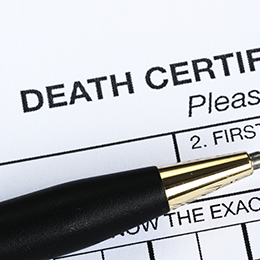 In Texas, there is a charge for a copy of the certified death certificates which varies by a few dollars depending on the county. (The original certificate if filed with the State.) Typically, it is a $21 fee for the first certificate and then $4 for every additional certified death certificate copy that is ordered. My strong suggestion is to order at least one more copy than you believe you will need. If you need to reorder additional certified copies, the $21 processing fee is charged again. One thing required by law is that charges commonly assessed by a funeral home must be included on the company’s General Price List (GPL). By Federal Law, a funeral home is required to provide this price list to families. Some funeral homes that are online-friendly, like aCremation, provide a direct link to the GPL on their site. aCremation realizes that understanding and comparing prices between funeral homes can be confusing. To simplify the decision for families, we have developed the Price Promise Guarantee. First, if your loved one is considered as “terminal” or under hospice care we will provide a price quote. If our prices increase within the next several months, we will still honor the original price so there are no surprises. Additionally, we provide a package price for simple cremation that includes the cremation permit, transporting your loved one to the crematory, the cremation container, temporary urn and the first death certificate. This provides families a simple straightforward way to understand our pricing.